Desh 2nd June 2018 Bangla patrika ebook pdf file. Desh is a fortnight traditional Bangla literary related patrika which has been publishing by Anandabazar daily newspaper from Kolkata in West Bengal. The magazine publish by two issues in every month on the date of 2nd and 17th. Now I'll share with all of my literary magazine reader friends an ebook pdf file of Desh on June 2nd, 2018 edition. 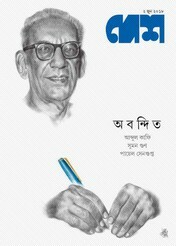 This edition's cover stories are Talk about Sharadindu Bandopadhyay, Comments about weird democratic process, article, travel, jiban je rokam, stories, serial novel, sudoku etc. Desh web site is desh.co.in. Readers can also collect all old issue of the Bangla Desh patrika from here.